Stick with me, kid, and you’ll never need to fight off the weekend brunch crowds again. As I’ve mentioned before, I love doing a special breakfast at home on the weekend instead of waiting in long lines at overcrowded bunch hotspots. 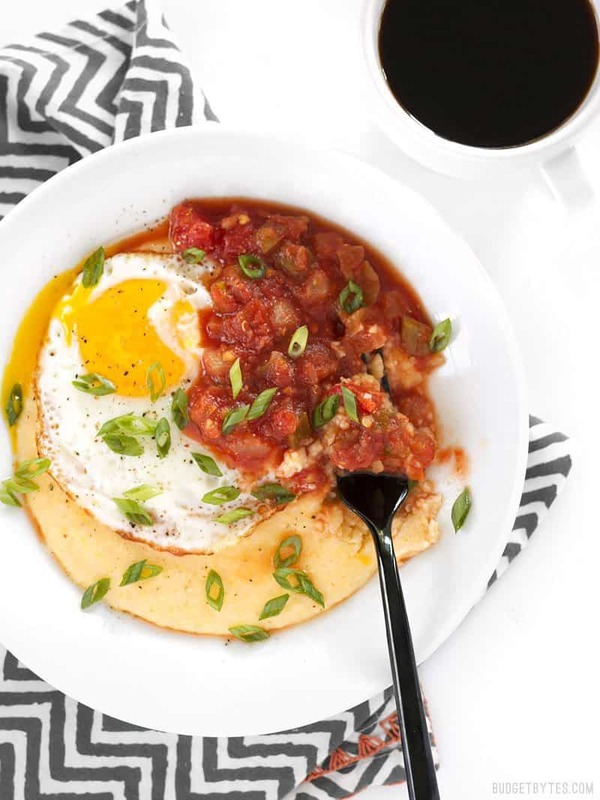 These Cheddar Grits Breakfast Bowls are totally restaurant worthy brunch grub that you can make at home, in your pajamas, while rocking out to your favorite tunes. Don’t have three friends to share your at-home brunch with? No prob. This recipe scales up OR down effortlessly. 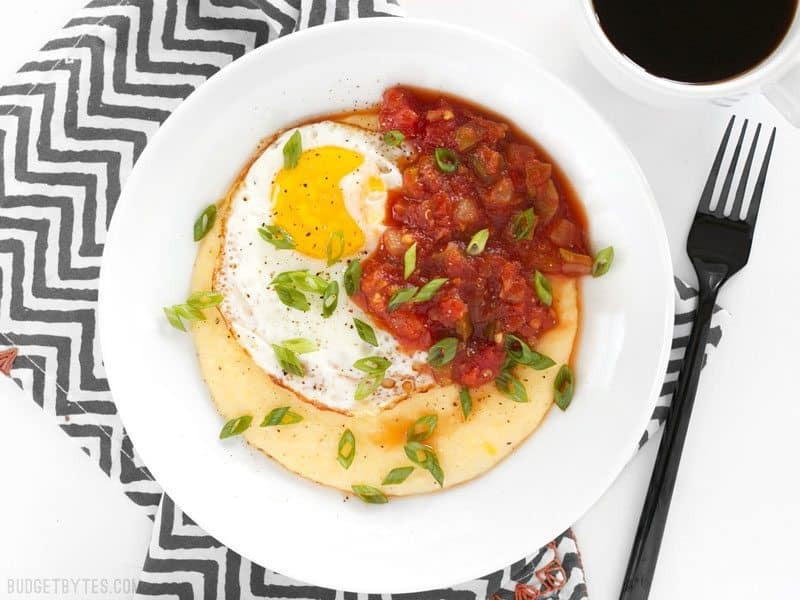 If you’re looking for a little more vegetable goodness in your breakfast, I think some sautéed zucchini and corn would make an excellent topper for these Cheddar Grits Breakfast Bowls. You can even season them up with a pinch of chili powder while they’re sautéing for even more southwest flare. As always, these bowls are totally customizable, so have fun with them! Want more savory breakfast recipes? 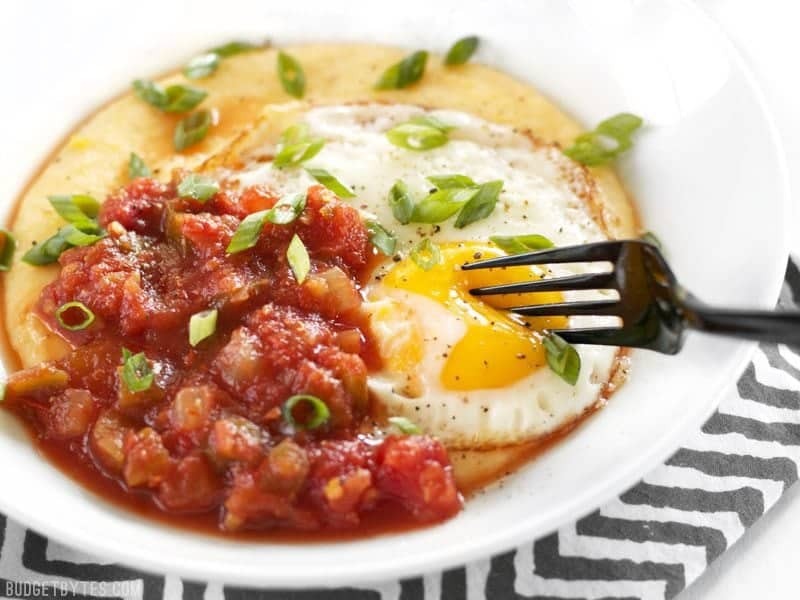 Check out our Savory Breakfast Recipe Archives! 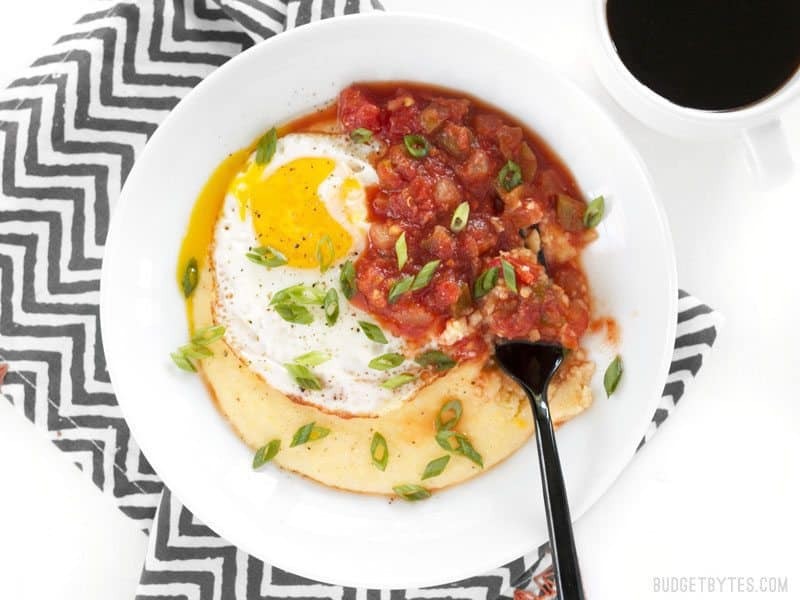 Cheddar Grits Breakfast Bowls are an easy but indulgent breakfast or brunch treat that you can whip up in no time. 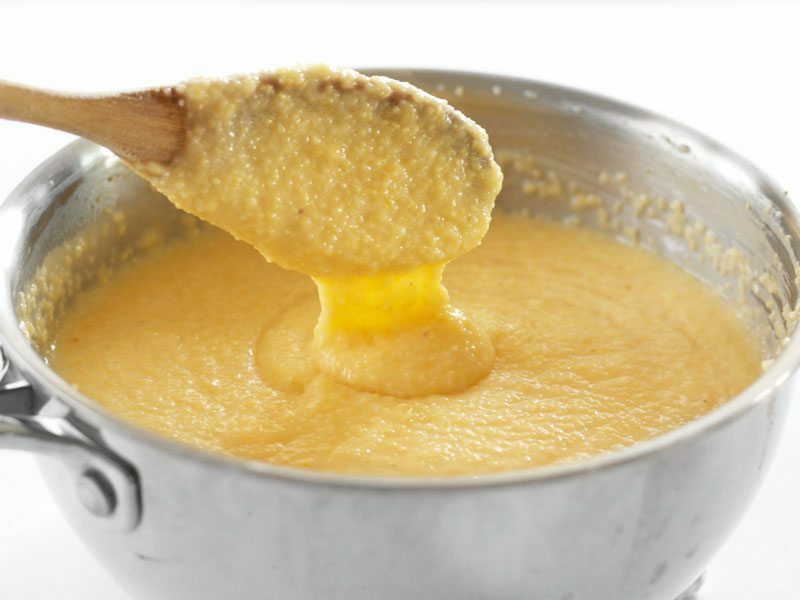 Add the butter and milk to the grits and stir until the butter has melted and the grits are smooth. 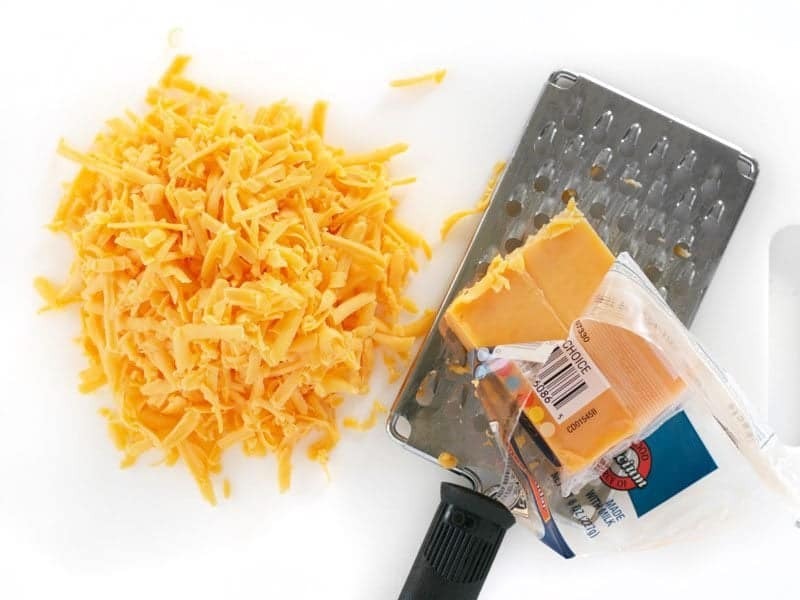 Stir in the grated cheddar, one handful at a time, until fully melted in and smooth. Leave the lid on the pot with the burner turned off to keep the grits warm. Cook four eggs using your favorite method (fried, scrambled, soft boiled, etc.). Slice the green onions. 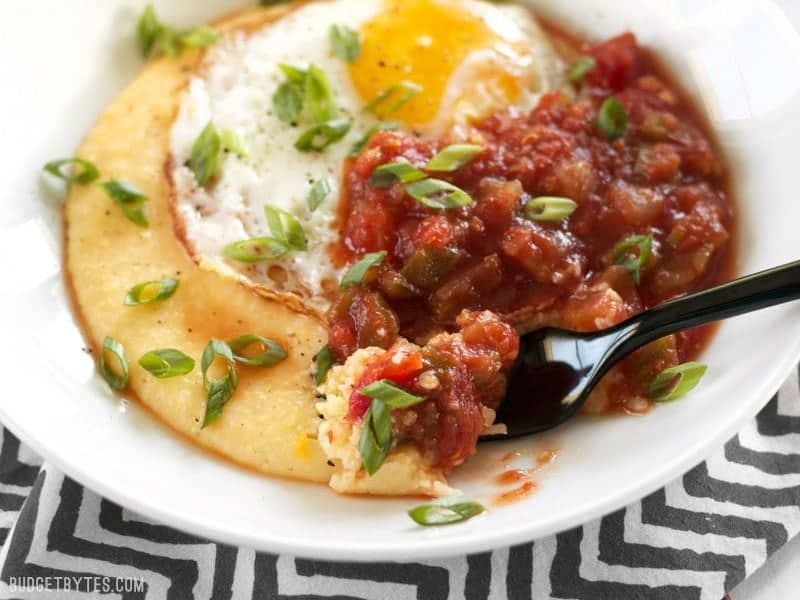 To build the bowls, place one cup of the cheddar grits in a bowl, top with one egg, 1/4 cup salsa, some freshly cracked pepper, and a sprinkle of sliced green onions. *Make sure to check the directions on your package of grits. Every brand is a little different and they may require a different cooking time or method. Just like oats, grits come in different forms, like stone ground, quick cooking, or instant. 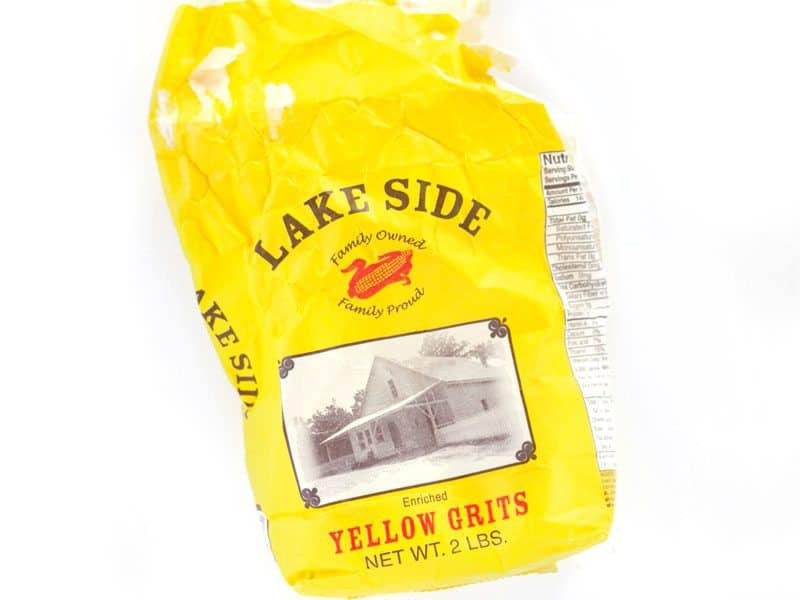 These are the grits that I used. While they don’t say “quick cooking” I can tell by the instructions on the back which indicate cooking for 5-7 minutes. 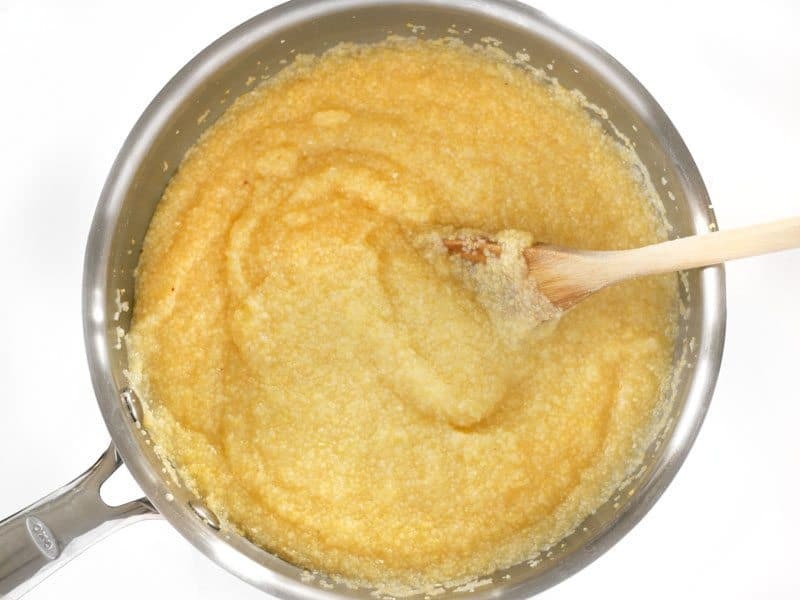 Instant grits will cook in about one minute, like instant oatmeal. 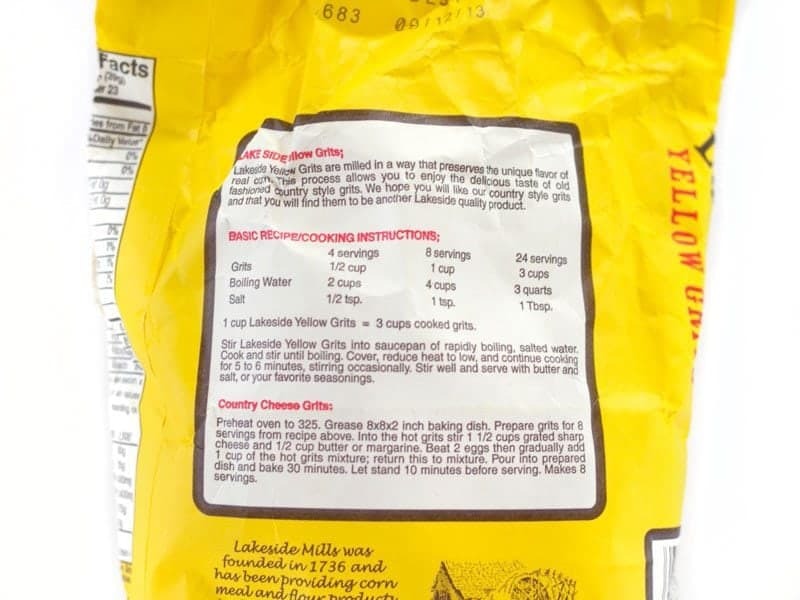 So no matter which type of grits you use, make sure to check the cooking instructions on back and follow that. You’ll need about 3-4 cups cooked grits. For my grits, I added 1 tsp salt to four cups of water. I brought the pot of salted water to a rolling boil over high heat, then stirred in one cup of grits, turned the heat down to low, replaced the lid, and let it simmer until thickened (5-7 minutes). 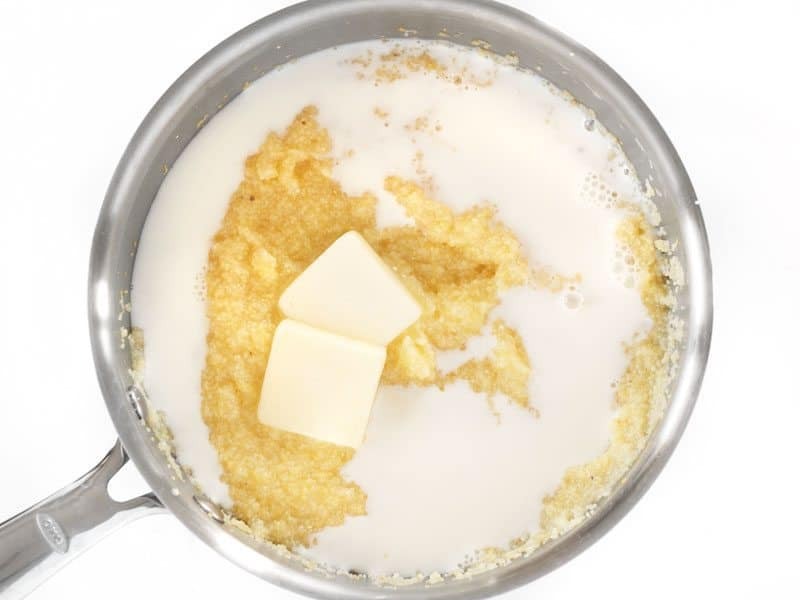 Once the grits are thick, add 2 Tbsp butter and 1/2 cup whole milk. Stir the milk and butter in until melted and smooth. Oh yeah, and while waiting for the water to boil, shred 4oz. medium cheddar cheese. 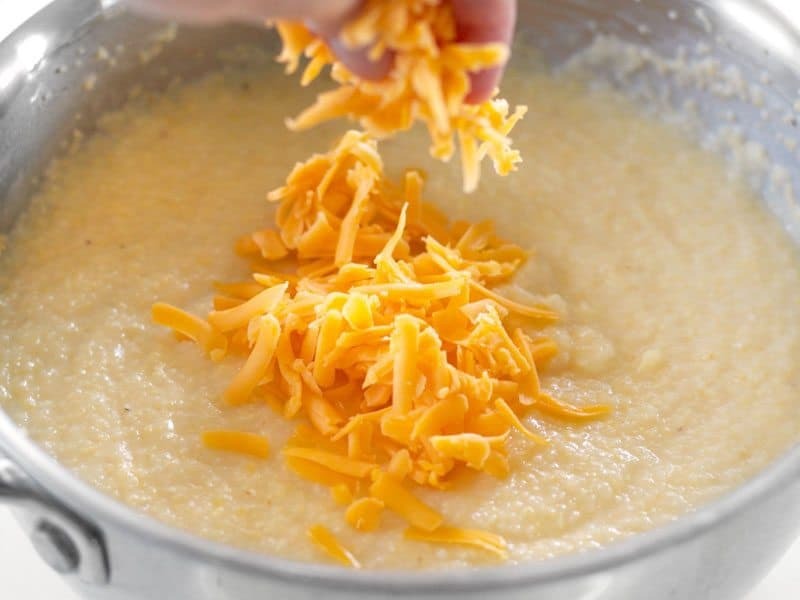 Stir the shredded cheddar into the grits until melted, one handful at a time. And then you have some awesomely delicious cheddar grits! All you have to do now is cook four eggs to your liking. You can fry them, scramble them, soft boil them, or just do whatever you want to them. Then building the bowl takes seconds. 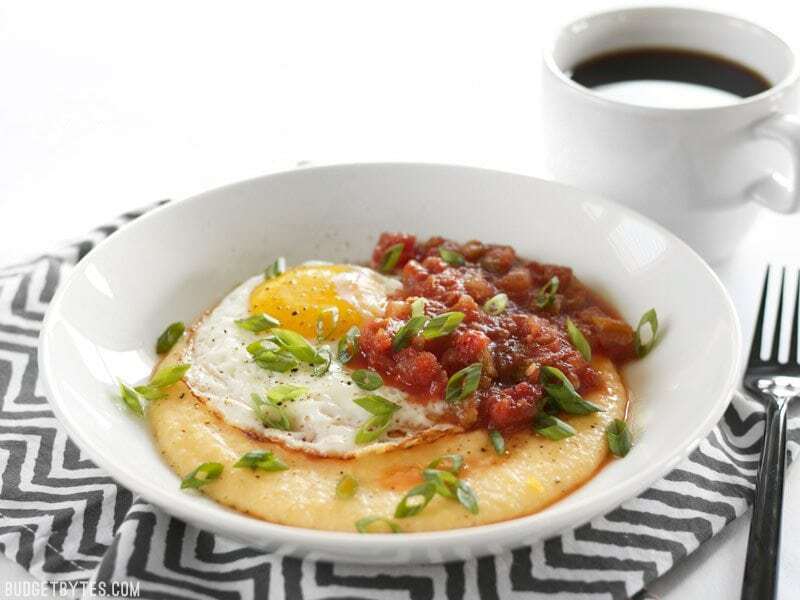 Start with about a cup of the cheddar grits, top with your egg, about 1/4 cup salsa, some freshly cracked pepper, and a sprinkle of sliced green onion. And I’m tellin’ you… these Cheddar Grits Breakfast Bowls are NO JOKE. So, this looked delish to me this am but I had very few of the ingredients. I used polenta instead of grits and sautéed some sliced yellow squash and made a quick Italian tomato sauce w some red pepper flakes for extra flavor. I used grated Parmesan instead of the cheddar. It was awesome. I realize anything this altered isn’t exactly a review of the actual recipe, but my point is – this really is a very flexible recipe base. Grits or polenta plus sauce plus egg. Yum. Many more versions will be made at our house!!! What a great recipe! Made this on Sunday for breakfast for me and my boyfriend. Delish! Easy and tasty, I will be making this again for sure. I have to comment because I make this all the time! I’ve never had grits before I found this recipe, but it looked soo yummy I just had to try it. I crave it all the time now! Thanks for yet another delicious, quick, and frugal recipe! Many of our go to recipes are from your site, my family loves them all! My mom always served grits and eggs with canned salmon—and she was from the South, so I suppose it’s authentic. I was just craving it this week, and oh I do love your bowl meals. Thanks! Hmm, I’ve never tried to freeze grits before, so I’m not sure. Either way, I’d definitely cook a fresh egg for each reheated portion. Oh man, this was so good. Definitely making this again very soon!! Just got done having this for lunch… wowzers! This is good stuff! Thanks! I basically lived on this recipe all weekend!!! YUMMMMMMM. This is awesome, I made this twice in the last week for dinner. I’m with you, would sometimes rather make a lovely breakfast special at home, though my husband offers to take me out. That grits bowl looks terrific! Wow, did this hit the spot after a night of tequila. Savory and extra quick because I had microwaveable grits. I added a few crumbles of leftover bacon and hot sauce. I think I’ll add one more sunny-side up egg and call it a hangover cure. Thanks so much for sharing.